How do I sign-in to Xara Cloud? There are two ways to sign in to Xara Cloud - either through an email login, or through a cloud storage provider. To start, click on a provider you wish to sign in through. Or else enter an email address. If you sign in with either Google or OneDrive, this will simply use the authentication of these drives and Xara will not connect to the cloud storage drive. This can be done later while in the program. Dropbox however requires you to connect to their drive also if you use their authentication to log in. After selecting your preferred provider, you will be taken to their website to sign in. We do not ever see your username or password, the provider you sign in with does the authentication, and this is all done safely and securely using OAuth. If you are already signed into a provider within your browser then this is the account that will be selected. If you want to use another account then you'll need to go to the provider's website and sign out. The first time you sign in you will see the dialog below. This is a confirmation message that a new account will be created against this sign in. Click 'Create new account' to continue. If you have forgotten your password with a cloud storage provider, you'll have to reset it with the provider you are trying to sign in with by going to their website and following their links to do so (normally if you go to sign in, there is a 'forgotten password' option). 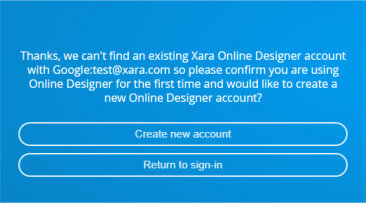 You can reset your Xara password here. After signing in, you can now connect cloud storage drives to your account, please see here: How do I connect my cloud storage drives to my account?